Local government elections are held every four (4) years on the third Saturday in October for the election of Mayors and Councillors. The Village of Kaslo is comprised of one (1) Mayor and four (4) Councillors. The next local government election is in 2018. The Village intends to promote improved bylaw compliance with photographs and descriptions of dogs that have been reported at large in order that they can be identified. Some residents have recently contacted the Village with concerns about cougar sightings, particularly in upper Kaslo. Wildsafe BC advises that the main reason that cougars come into town is to follow deer. When near residences, they may encounter pets or other small animals that also can become prey. Here is a calendar for all Kaslo residents for recycling and garbage collection for 2018/19. recycling is every other Tuesday in conjunction with the garbage pick up.. Please fell free to contact our office for further details. This is a free service. 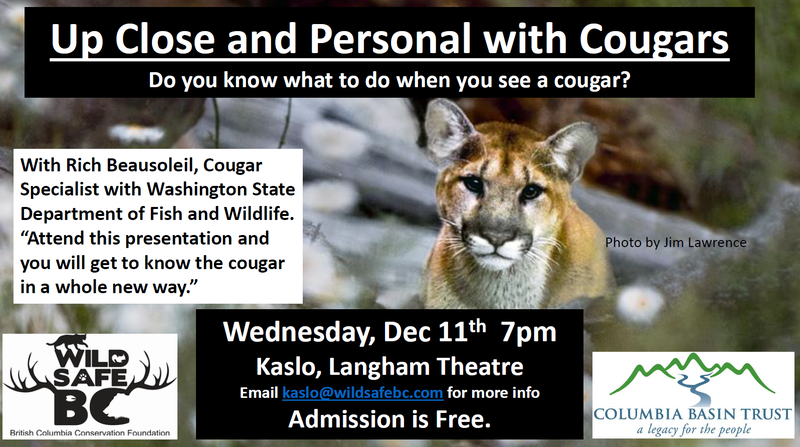 Kaslo WildSafeBC is hosting a cougar presentation next Wednesday, Dec. 11th at the Langham Theatre, 7pm. Thank you for providing the delegation on November 12th to the Village of Kaslo by Mr. Neuner and Dr. Etherington.